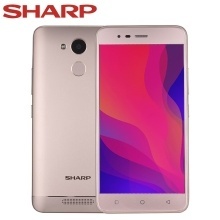 The Sharp R1 features a 5.2 inches IPS display with 720 x 1280P resolution, powered by Mediatek MTK6737 chipset, 3 GB of RAM and 32 GB of internal storage, and it runs on Android 7.0 OS. It comes with a non-removable Li-Ion 4000 mAh battery. Its rear camera 13MP and selfie camera 8MP are designed for recording the best moment of your life, fingerprint sensor fast unlocked your phone, built in GPS, BT, Wi-Fi, supporting 4G network. Large screen, wide horizon, the Sharp R1 features a 5.2 inches IPS display with 720 x 1280P resolution, good for watching movies and viewing beautiful images. The SHARP R1 is powered by Mediatek MTK6737 chipset, 3 GB of RAM and 32 GB of internal storage, and it runs on Android 7.0 OS. The SHARP R1 comes with a non-removable Li-Ion 4000mAh battery with low power consumption, long lifespan use offered, and non-removable battery gives the smartphone a good battery backup. 13MP, f/2.0, AF camera designed on the rear and 8 MP, f/2.4 selfie camera capture the best of you and record the significant moment of life. The Sharp R1 is equipped with fingerprint sensor for fast unlocking your phone. But Sharp R1 supports Multi-language. 3. What&apos;s the Languages of tihs phone?